My first introduction to this week’s Girl Banker of the Week was in 2016 at the Arkansas Bankers Association Women In Banking Conference when she sat on a panel with recently retired, Lisa Ray of Arvest Bank. As she answered questions from the audience about how she managed work, life, balance, and overcoming typical stigmas that come along with being a female in this industry, I immediately knew I would be seeing more of her at some point in my career. I was pleasantly surprised when I received an email from a fellow girl banker and fan of Donna, nominating her for Girl Banker of the Week. While we have only communicated via email and social media, I have a feeling I have a new friend and mentor! Here is Donna’s Girl Banker story! When Donna was 8 years old, she wanted to be a veterinarian. In high school, she shifted toward being an attorney. (A girl can be whatever she wants to be, am I right?) She didn’t end up pursuing either one and according to Donna, never really decided what she wanted to be when she grew up. 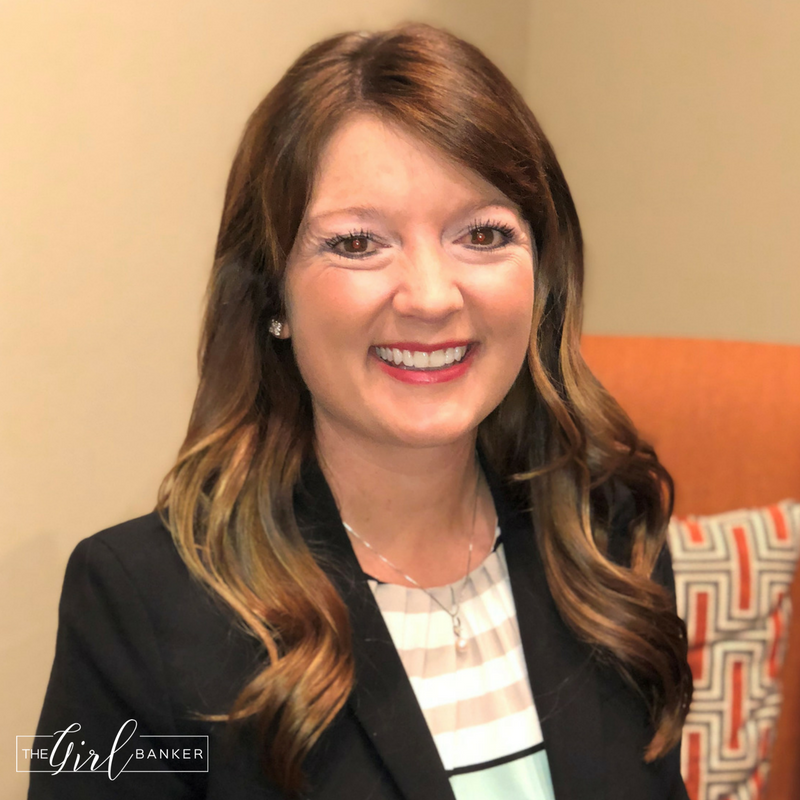 She graduated from the University of Central Arkansas with a bachelor’s in Business Administration with an emphasis in Marketing but didn’t begin her career in banking until several years later. “I’m very fond of the motto, ‘bloom where you’re planted’ and I feel that my career is a testament to that,” Donna said. Immediately following college, she worked at R&G Sloane as a Customer Service Rep for three years and then Acxiom Corporation for eleven years. 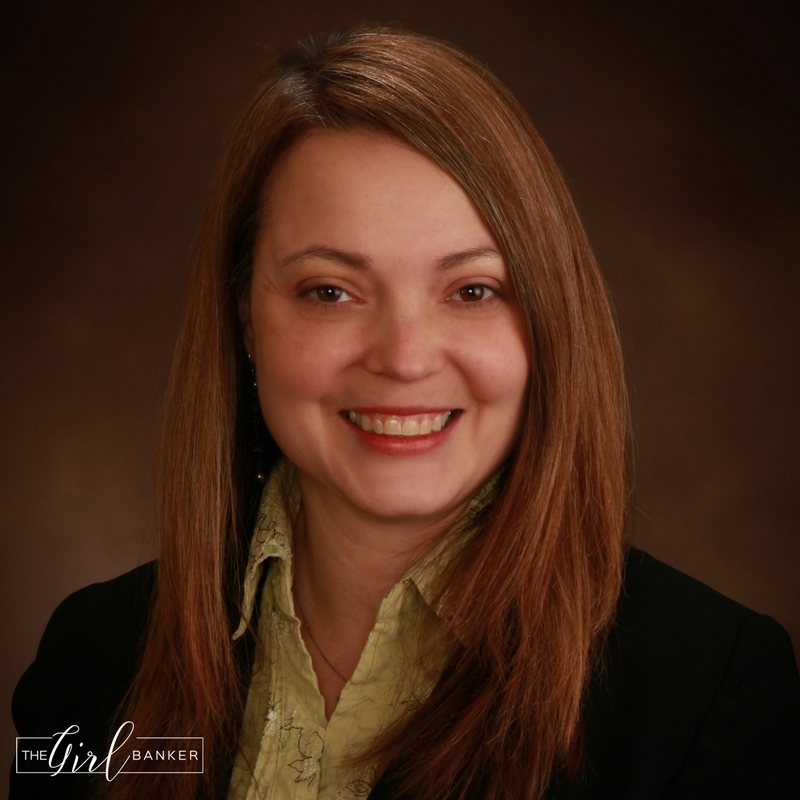 Her girl banker story began in 2007 when she joined Conway, Arkansas based Centennial Bank as a project manager. And girls, let me tell you, Donna began to bloom! In 2009 she was promoted to Director of Corporate Efficiencies and managed Centennial’s initiative to lower their efficiency ratio from the 60’s to the 30’s. By 2016, Donna was promoted to Director of Marketing and has since served on the Operations Committee, Strategic Planning Committee, Executive Committee, and M&A Committee. Earlier this week, it was announced that Donna was promoted, yet again to Director of Investor Relations for Centennial Bank and Home Bancshares, Inc., parent company of Centennial. Donna has served as a mentor to many women in the industry throughout her career. She has had the opportunity to speak at the Arkansas State University Business Women’s Leadership Conference as well as the Arkansas Bankers Association Women In Banking Conference and participated in the University of Central Arkansas Young Business Women’s Conference. “I enjoyed the opportunity to interact with the college ladies and hear about their future plans and share with them my own experiences,” said Donna. Donna and her adorable daughter, Riley. Join me as we celebrate this week’s Girl Banker of the Week, Donna Townsell! Not all bankers come in the form of a lender, teller, president, new accounts representative, or marketing director. There is another banker role that is likely not celebrated enough and plays an incredibly important role in the continued safety and soundness of America’s community banks: the bank examiner. For those of you who aren’t familiar with bank examiners, here is the definition according to Wikipedia: A bank examiner is a financial professional, a species of auditor, who has the task of making sure that banks…are operating legally, ethically, and safely, in accordance with the bank regulations imposed on these institutions by the chartering level of government. In the United States, they may conduct supervision on behalf of state governments, a United States government agency, or the Federal Reserve System. The main duties of a bank examiner are to ensure that a bank’s operations are legal and can guarantee financial stability. A bank examiner will also review the balance sheet, evaluate the level of risk associated with a loan, and assess the management of a bank. Got it? Meet Michelle Hodge, Review Examiner for the Texas Department of Banking in Austin, TX. 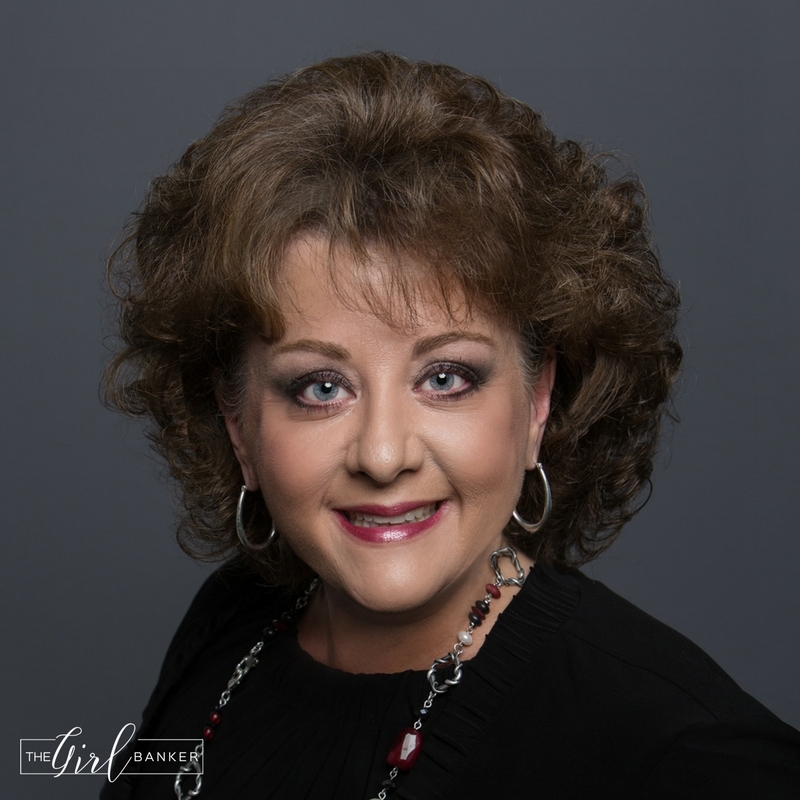 Michelle got her start in banking in 2006 as an Accounting Analyst at Platinum Bank in Lubbock, Texas, which happened to be one of the last state chartered de novo banks prior to the Great Recession. While there, she worked directly with the CEO and CFO to purchase a branch from another financial institution and with the Texas Department of Banking on the de novo bank application and director profiles. She performed the role of accounts payable, assisted with setting up internet and telephone banking and was instrumental in preparing board reports and policies. Michelle, and her girl banker pals, Molly and Katie at their GSBC graduation in 2017. 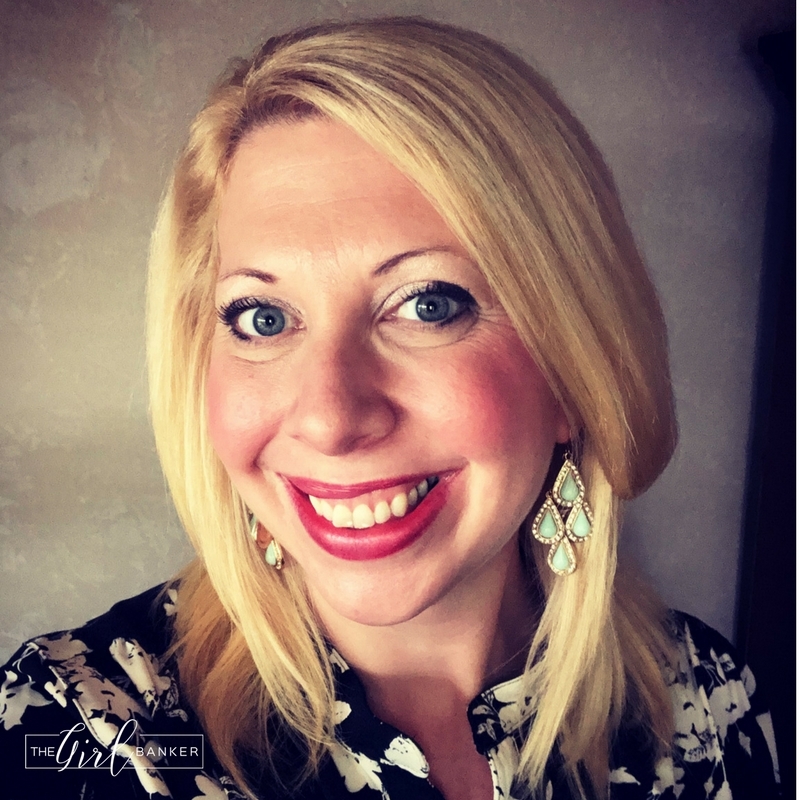 Michelle graduated from Texas Tech University in Lubbock in 2007 with a Bachelor’s in Business Administration degree and was hired by the Texas Department of Banking in Houston as a Financial Examiner I in 2008. 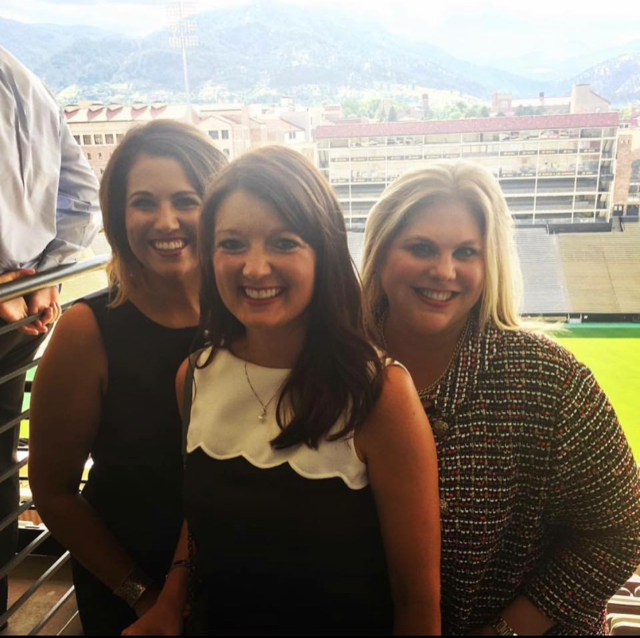 In March of 2013, she passed the commissioning process and was promoted to a Senior Financial Examiner VII in September of 2017, just a few months after graduating from the Graduate School of Banking in Colorado. Her roles included acting as Examiner-In-Charge (EIC) of all types of examinations regardless of size and complexity, ensuring proper application of department policies and procedures in addition to state and federal regulations, and serving as a leader, mentor, and supervisor of less experienced examiners among many other duties. In February of 2018, Michelle was promoted again to Review Examiner of the Texas Department of Banking which relocated her to Austin. She performs the Austin Headquarters review of regional examination reports and is always keeping up with the ever-changing laws, regulations, policies, and procedures of federal or other regulatory agencies that may affect the Department. The fact that a female has this role is a BIG deal. She’s a trailblazer, to say the least. When she isn’t keeping all the banks in Texas in line, Michelle and her husband, Stephen, of 15 years, and their dog, Gustav, love a good walk. They also are avid travelers, having visited 8 eight different countries in the last four years and have a trip booked for Singapore, Phuket, and Bangkok later in 2018. Michelle also serves as a Graduate School of Banking Strategic Topic Advisor and volunteers for the Susan G. Komen 3-Day event. She has walked in six Susan G. Komen 3-day 60-mile walks herself with 5 being in Dallas and 1 in San Diego, CA. Additionally, she is a member of the State Agency Council that supports the Governor’s Commission for Women. Her hobbies are running, hiking and basically anything outdoors. She even climbed a fourteener in Colorado last year! 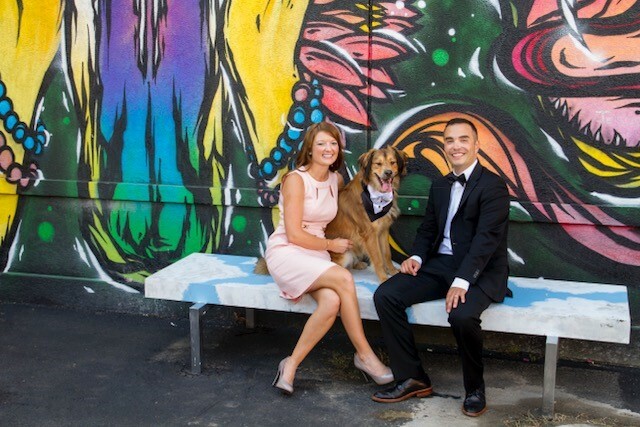 MIchelle and her husband, Stephen and dog, Gustav. Join me as we celebrate this week’s Girl Banker of the Week, Michelle Hodge! It’s no secret that I am a huge fan and alum of the Graduate School of Banking in Colorado and I love any opportunity to shed light on products of their program. However, this week’s Girl Banker of the Week isn’t just any “alum” and her resume is proof of that! Sheila Noll is an institution of operational banking knowledge and her list of organizations that she shares it with is nothing short of impressive. Here is her Girl Banker Story! Sheila got her start in banking straight out of college in 1995 as a cash management specialist for Midwest Independent Bank in Jefferson City, MO. In August of 1997, she transitioned to the loan department as a credit analyst and then returned to the operations department as the operations manager in June 1998. She has worked in various managerial positions within bank operations since that time and now serves as Executive Vice President and Chief Operations Officer. As a member of the Executive Management Committee of MIB, she participates in organizational leadership, direction and guidance related to community bank servicing across the Midwest. MIB is a “bankers’ bank”, based out of Jefferson City, MO, which provides a wide array of correspondent banking services to close to 525 financial institutions throughout the Midwest. She was given her start in banking by one of the country’s largest community bank advocates, Camden Fine, who was the founding president of Midwest Independent Bank. Camden went on to lead the Independent Community Bankers of America (ICBA) as President/CEO in 2003. “He is still a strong mentor for me today and has a great respect for women in banking.” A testament to that is the recent appointment of Rebeca Romero Rainy as President/CEO-elect of ICBA just this past month. Sheila has shared her wealth of knowledge in bank operations through current and past participation in a number of banking-related committees outside of MIB, such as: Chair of the Graduate School of Banking in Colorado Alumni Board, Faster Payments Task Force member with the Federal Reserve Bank, ICBA Operations & Payments Committee member, the Bankers’ Bank Operations Council, the ABA Correspondent Bank Work Group, The Clearing House RTP Advisory Committee and various government relations activities on behalf of community banking. She currently spends much of her time participating in local and national discussions regarding existing and emerging payment processing solutions in the United States and globally. Noll earned her bachelor’s degree in finance from Central Missouri State University (now University of Central Missouri), in Warrensburg, Missouri. She subsequently graduated, with honors, from both the Missouri Bankers Association School of Bank Management and the Graduate School of Banking in Colorado. Sheila with daughters Allison and Katie. Join me as we celebrate this week’s Girl Banker of the Week, Sheila Noll! Know someone who should be the next Girl Banker of the Week? Send nominations to thegirlbanker@gmail.com! When I started the Girl Banker of the Week, I found it important to highlight women from a wide variety of banks, positions, backgrounds, etc. While I am obviously incredibly biased to my bank, Grand Savings Bank, I also wanted to convey that the purpose of this blog is to advocate women in banking, not just my employer or even myself for that matter. 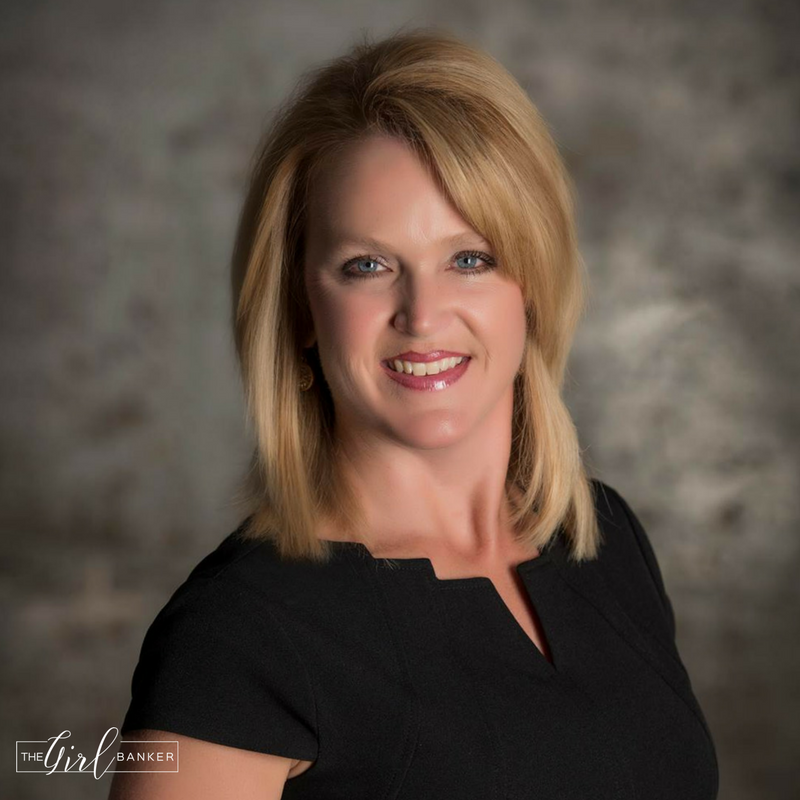 However, its high time I throw GSB some love and I’m excited to recognize Jill Bright, SVP, Business Development Officer of Grand Savings Bank in Rogers, Arkansas. That, my fellow girl bankers, is a lesson to ALL of us. We all can get caught up in our busy schedules and get so task focused that we forget why we are bankers in the first place. You never know what a few minutes or even hours could mean in a customer’s life. Here is Jill’s Girl Banker story. Jill, a 32-year banking veteran, moved to Rogers, Arkansas from Joplin, Missouri in 1978. She graduated from Rogers High School in 1985 and attended Arkansas Tech University. She began her banking career at Independence Federal Bank in Springdale, Arkansas in 1986. Jill always had the goal to be a banker in her hometown of Rogers and I think it is safe to say that she knocked that goal out of the park. She was hired in 1987 by First National Bank, which was later acquired by Arvest Bank. During her 18 year tenure at Arvest, she served as a teller, teller trainer, lead teller and teller operations manager. In 2005, Jill left to start a new bank in Northwest Arkansas, Parkway Bank, which was later purchased by Citizens Bank in 2015. She served as branch manager and was later promoted to Director of Marketing and Business Development. If anything can be said about Jill Bright, its that she is EVERYWHERE in Northwest Arkansas! She loves all things community and NWA. She serves on the Rogers Lowell Chamber of Commerce Board of Directors, Chamber Audit Committee, and is a Chamber Ambassador where she received the 2014 Ambassador of the Year Award. She also has a seat on the Rogers Rotary Club Board of Directors, is a Paul Harris Fellow, and is a 2016 graduate of Leadership Benton County. Jill is also a former board member of the Arkansas Crisis Center Board and is a member of Cross Church in Rogers. Jill, her husband, Richard, and daughter, Lauren. Jill has been married to her husband, Richard, for 30 years and has one daughter, Lauren, who is 28. When she isn’t serving her community or bank, she loves reading, boutique shopping, and spending time with her family and friends. Most importantly, she loves her dog, Berklee. 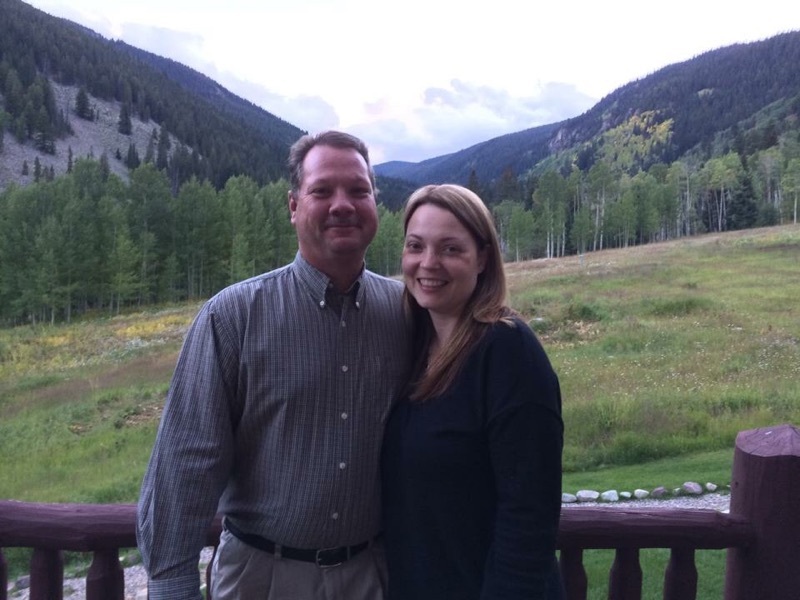 Join me as we celebrate this week’s Girl Banker of the Week, Jill Bright! Emily Mays serves as Vice President and Senior Marketing Director for Community Spirit Bank, a $142 million bank headquartered in the Northwest corner of Alabama. This Barret School of Banking graduate began her career at CSB in 2013 as a drive-thru teller and rose through the ranks very quickly. This is her Girl Banker Story! Growing up a farmer’s daughter, the value of hard work was instilled in Emily early on. In fact, she firmly feels those virtues have helped her navigate through life. 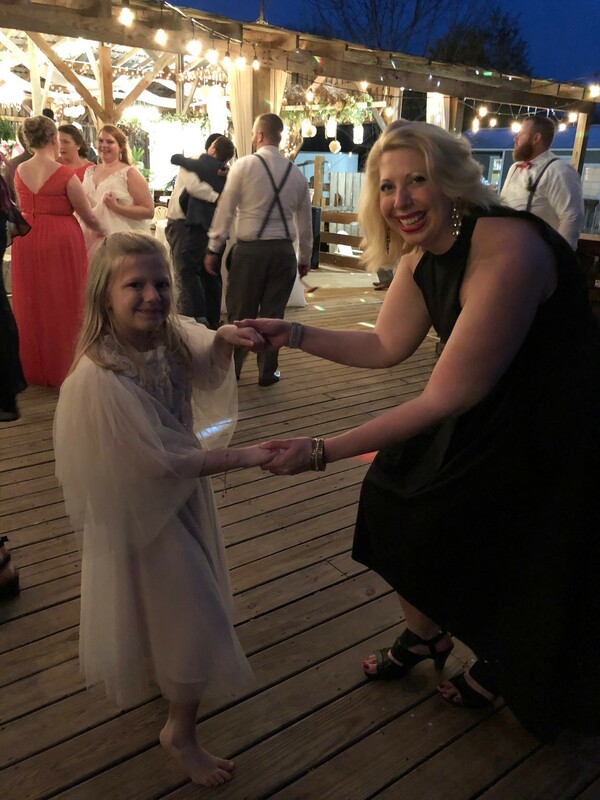 Marrying at the young age of 18, she found herself leaving the only community she had ever known of Russellville, Alabama. 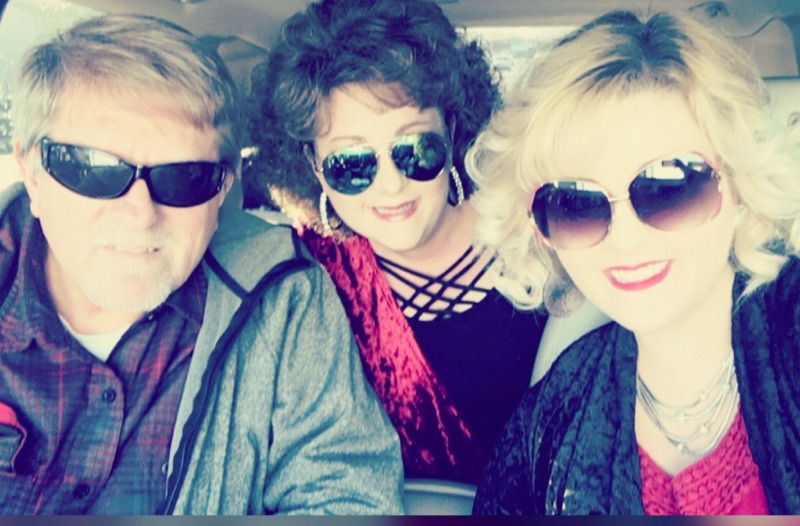 She received her Bachelors in Business from the Univerisity of North Alabama in 2003 and went on to manage her in-laws’ furniture store where she began dabbling in advertising. She loved helping lay out the newspaper ads and recording radio spots. Her passion for marketing was sparked! In 2005, Emily began her career in banking after a move to Auburn, Alabama. She began working as a retail lender at Citifinancial and found her rhythm as a loan officer. While living in Auburn, she had her daughter, Lola Olivia. Soon after, Emily and her family relocated back to Franklin County, Alabama. She was finally going home after 10 years. After returning to Russellville, AL, Emily was able to maintain her position with Citifinancial by commuting to a branch in Decatur, AL. Although the commuting wasn’t ideal, it was necessary for a few years until she was able to transfer to a branch in Russellville. Emily and her daughter, Lola. Unfortunately, during this time, as things began to fall in place for Emily, things also began to fall out of place. 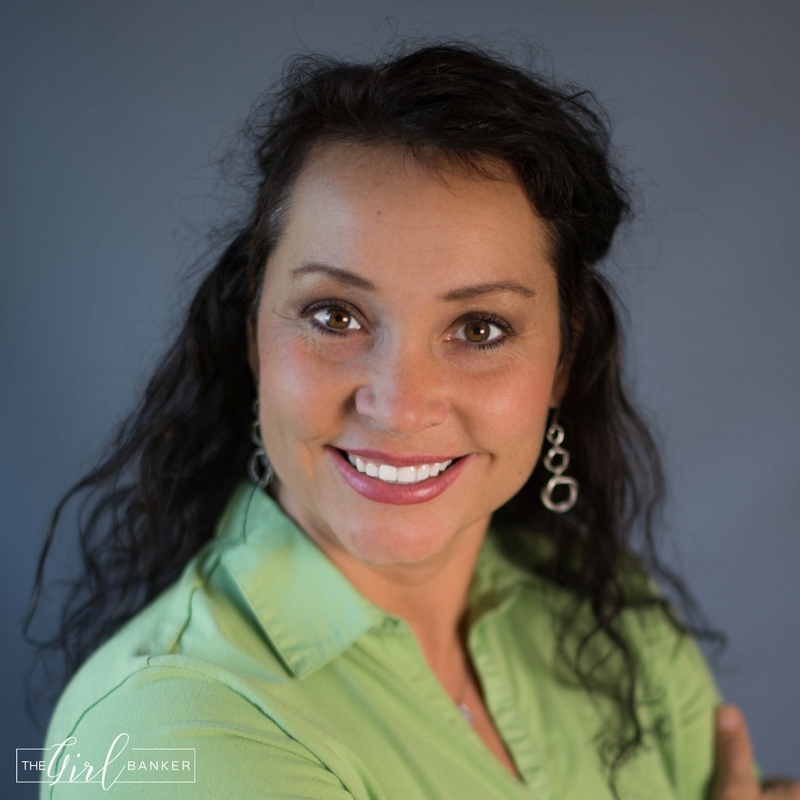 Within the span of just a few months, she was newly divorced, going through selling her home and found out her Citifinancial branch in Russellville was closing. Thankfully, Emily and Lola were able to find a home close to her family and she was finally back in her hometown. At the advice of a friend, Emily applied for a teller position at Community Spirit Bank in Russellville, AL. At this point, she had 8 years of banking experience under her belt and applying for an entry-level position was a bit begrudging. Regardless, Emily was resilient and wanted to get a fresh start so she applied. After her third interview, Emily remembers sitting on her kitchen counter and seeing the bank’s number pop up on her caller ID. She was starting to question why this bank thought it was necessary for tellers to go through so many interviews! Unbeknownst to her, the EVP/COO/HR Manager of CSB was relentless and saw potential in her and potential for the bank. Emily was hired for the teller position and started eight days after walking out of a job she had been at for over eight years. She recognized immediately this was her chance to do things differently. Her previous banking experience was in a big corporation with no personal touch and now she was working the drive-thru at a community bank. At that point, she set a goal for herself to be the highlight of every customer’s day. Sometimes the power of a smile can change everything. She began to ask herself what made the banking experience better… was it speed, friendliness? If so, then do those things, but for every customer you touch, you should strive to make it the best banking experience they have ever had. And the rest is history. Slowly she was incorporated into marketing projects and within five months of starting at Community Spirit Bank, she was moved to the main office as Marketing Director. Emily continued to help out on the teller line when needed. “That’s the heart of community banking. When everyone pulls together to help out.” A few years later she was promoted to Marketing Director/Executive Assistant to the President/CEO and started learning about what made the bank tick. More recently, she was promoted to her current position, Vice President/Senior Marketing Director. Not a day goes by that Emily isn’t thankful for her role at Community Spirit Bank and for all of the ups and downs that got her there. Working to carry out the bank’s EverFi Financial Literacy mission is one of Emily’s favorite areas of focus. Providing support to her bank’s ten sponsored schools is a highlight of her public relations role. To date, they have reached over 2,800 students and that number keeps growing. In 2016 she was elected to the Franklin County Chamber of Commerce Board of Directors and was recently elected to serve as Vice President of the Director’s Executive Board in 2018. She also serves as a team captain for CSB’s American Cancer Society Relay team. In addition to being a full-time banker and full-time mom to Lola Olivia, Emily has also found the time to squeeze in two half marathons. She also happens to be a superhero fangirl and a lover of hiking, cooking, going to the movies and of course coffee. Join me as we celebrate this week’s Girl Banker of the Week, Emily Mays! INTRO | This week, the Girl Banker of the Week has a unique story. Not only is she a hard working mom, but she is also an entrepreneur and a philanthropist with a personal vested interest in giving back to single parents. 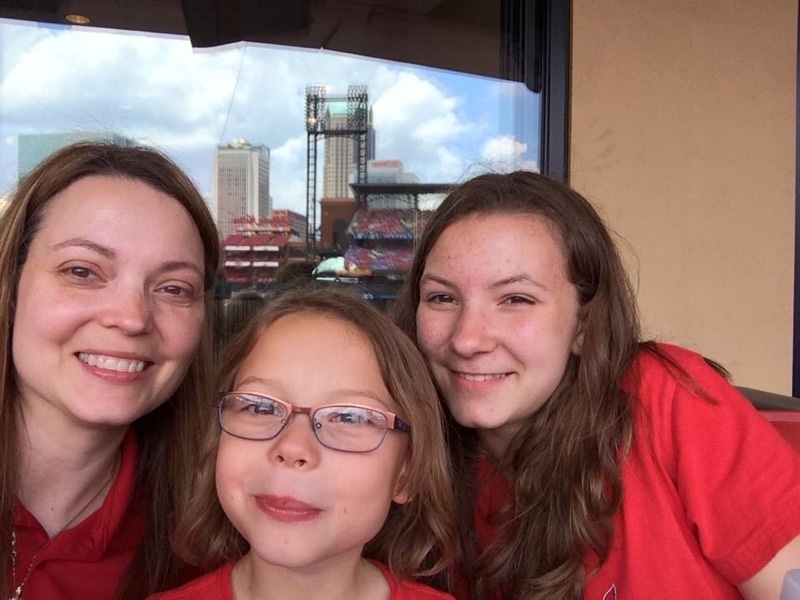 I became connected with Autumn as a result of our being on the Single Parent Scholarship Fund of NWA Board of Directors and I’m proud to highlight her and her story this week on the Girl Banker! 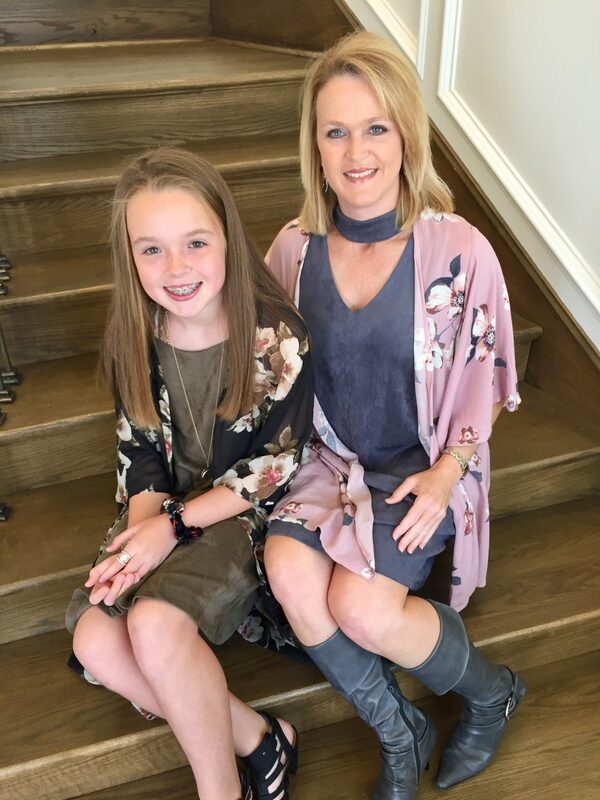 GIRL BANKER STORY | Autumn is nearing her 15th anniversary in banking, all of which has been with Cornerstone Bank, headquartered in Eureka Springs, Arkansas. She got her start as a teller and then was promoted through the ranks, serving as Account Opening Deposit Representative, Loan Assistant, Marketing Director, Board Secretary, and Executive Assistant to the President and CEO. She now is an AVP, Loan Officer, specializing in mortgage lending. Through her rise in the ranks of Cornerstone Bank, she has witnessed her small community bank grow from two branches to 6, serving 3 counties in North Central Arkansas. She earned a Bachelor’s of Science in Mass Communication with a concentration in Advertising and Public Relations from East Central University in Ada, Oklahoma. She is a graduate of the American Bankers Association Bank Marketing and Finance School at Southern Methodist University in Dallas, Texas. Autumn and her kids at a SPSF NWA Event. HER INSPIRATION | Autumn is a single mother of two children, Anna-Claire,12 and Jackson, 9. She is incredibly involved in her community of Huntsville, Arkansas and thrives on being exposed to new experiences, meeting new people, and challenges. Her number one goal in life is to raise her children to be caring and appreciative adults that want to give back. 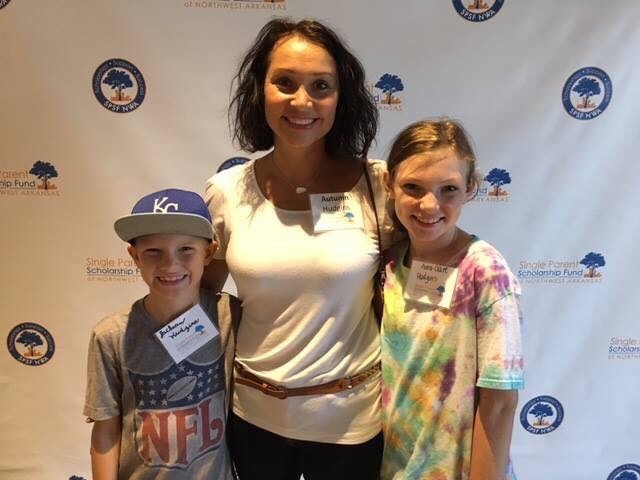 While her children are involved in numerous activities themselves, Autumn has always included them in her own volunteer work in order to serve as an example. She currently sits on the Single Parent Scholarship Fund of NWA Board of Directors as Secretary and is a past member of the Eureka Springs Rotary Club, Eureka Springs Main Street Board, Carrol County Relay for Life committee and was a graduate of Leadership Arkansas: Carroll County. Being an independent, confident woman comes naturally to Autumn. She learned these traits from her mother, who took on raising Autumn and her brothers alone after losing their dad at the age of 13. Autumn watched her mom persevere, making ends meet as an entrepreneur but always making sure her children had a happy childhood with a positive future. Her mother is now retired from owning her own business but her determination and zeal still serve as an inspiration to Autumn and is the number one reason why she is an avid supporter of the mission of the Single Parent Scholarship Fund of NWA. A single mother herself, Autumn vows to give back to single parent’s pursuing their dreams through furthering their education by providing advice, support and love. She feels that the recipients of the SPSF NWA are living proof that regardless of your situation, you can achieve your dreams and create a better, brighter future for your children. When Autumn became a single mother in 2012, she was more determined than ever to find a way to provide more for her children in addition to her banking career. In 2013, she became an entrepreneur herself, purchasing the Crooked River Cabins Resort in Battiest, Oklahoma near her childhood home. The resort includes luxury cabin rentals that overlook the Glover River and attract guests from all over the US. Buying the resort not only gave Autumn a safe haven near her family but also proved to be a way for her to invest in her childhood community. Join me as we celebrate this week’s Girl Banker of the Week, Autumn Hudgins!